One common thing that happens in long-term relationships is that the couple stops showing their love for one another. This lack of focus on your partner makes the relationship a bitter one. Sometimes this means you are simply no longer in love with that person. Sometimes, after years of marriage or dating, a significant other can start to feel more like a roommate than a romantic partner. If your partner really is “the one” for you, falling back in love with them isn’t impossible. 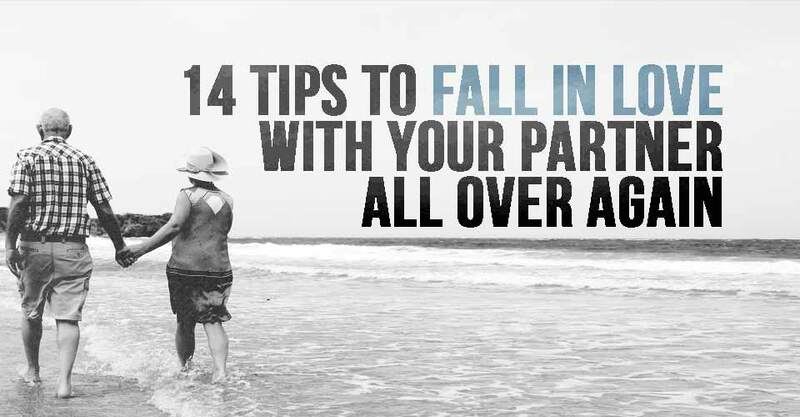 Here are some tips on how to fall in love with your partner all over again. 1) Realize what made you love them in the first place. Find what it was that attracted you to them in the first place. 2) Communicate to your partner about how you feel about the relationship. Talk to them about things that you both can do differently to meet your needs and expectations. * What was the relationship like in the beginning? * What made you love them? * What has attracted you to them? * How much this relationship means to you? 4) Pay attention to your partner, don’t let them feel ignored. Concentrate on what they are saying to you without arguing. This will make them feel good about you, eventually allowing them to fall in love with you all over again. 5) Think about how often you and your partner actually share physical contact. Active physical intimacy is a must for a relationship to stay healthy. If you think the intimacy between you and your spouse is way too low, try to be more active. Be more touchy-feely. Research has established that touch communicates a wider range of emotions than mere gestures. 6) The longer you keep yourself away from other people, the harder it’ll be to get back to them. Too often we let life’s troubles create a gap in our relationships. If a gap is already made, work to fill it up. It can be as simple as just going on a date. 7) Never allow a negative thought to linger in your relationship, replace it with a positive thought. 8) You have to stop looking for perfection in your partner, everyone has flaws. Once you realize this, it’s less likely you will be annoyed by small imperfections and you will start loving your partner for who they are. 9) To make them love you again, ask about and be sensitive to their needs. Also, you can increase mutual understanding by working together to meet each other’s needs. 10) Focus on all the positives of the relationship and remind yourself of all the wonderful things that your partner has brought to your life. This act alone can make you fall in love all over again. 11) Travel together to new places, this refreshes the relationship, when you travel together, you get to know about each other better. Take a vacation, schedule some time off from your regular responsibilities. Spend some quality time together, go on a date or a movie, it can seem strange to go on a date with your own partner, but it is important to keep your relationship a priority. 12) Admire them like you admired them in the past. Admire their attractive qualities, this will let you fall in love again and again with the same person. 13) Approach your relationship with complete trust. There is no room for jealousy in a healthy relationship. Once you re-establish your trust, you will start loving your partner again. 14) If you think you can’t handle it on your own, look for a therapist or counselor. Ask the suggestions from your family or friends. You could find people who have training in couple’s counseling. You could find them online too.